Welcome to Las Cruces New Mexico! Conference photos are now available, courtesy of David Hathaway and others! 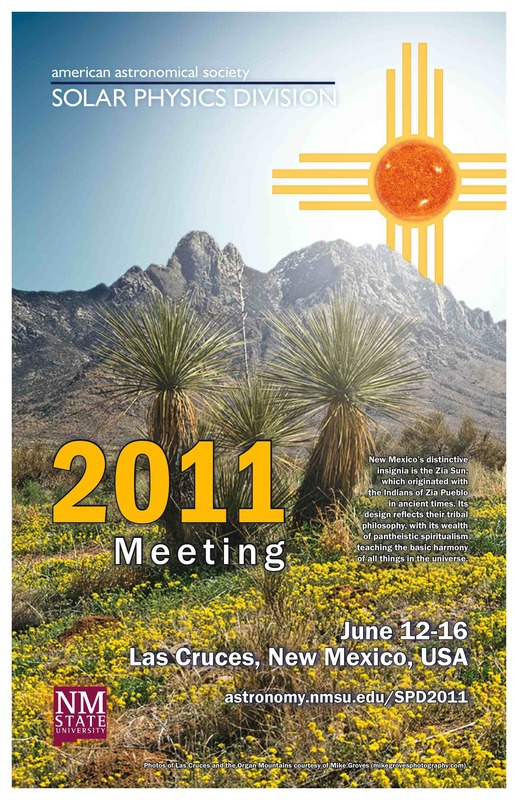 The 2011 SPD Standalone Meeting is proudly hosted by New Mexico State University! The venue is the Las Cruces Convention Center and the main conference hotel is Hotel Encanto. We are sure this will be a relaxed yet productive meeting that captures the exciting current research in solar astronomy. In addition, you will find the southwest U.S. truly beautiful and enchanting. Our excursion will take us to the dunes of the lovely and unique White Sands National Monument. If you come early or stay late (highly encouraged), don't miss Carlsbad Caverns and other great local attractions. May 28, 2011 Hotel Encanto booking deadline for conference rate. You may still book rooms at this hotel at very reasonable rates. June 1, 2011 Online registration deadline. Registration must now be done on site. 1 June: The full abstract book is available for download on the scientific program page. You can download a .pdf, an .rtf, or a version for your smart phone and eReaders. 22 May: A signup sheet is now available for the Sunday morning hike to Dripping Springs. Please try to arrange transportation between those with and without vehicles. 12 May: If you are not renting a vehicle and need shuttle service from El Paso to Las Cruces (and back), please see the travel page for directions on how to book with the Las Cruces Shuttle at a discounted rate. 19 April: NOTE: The first scientific session will be Monday morning June 13. The final session will end Thursday afternoon, June 16. The scientific program is currently being assembled. 12 April: American and Continental airlines are offering discounts on flights to El Paso for the meeting. See the travel page for the coupon codes you can use on the wesbites. 20 March: The student/teacher reception/workshop, and the main conference reception on Sunday evening (June 12) will take place at the NMSU golf course in the banquet room and the lounge, respectively. For details, see the events page.